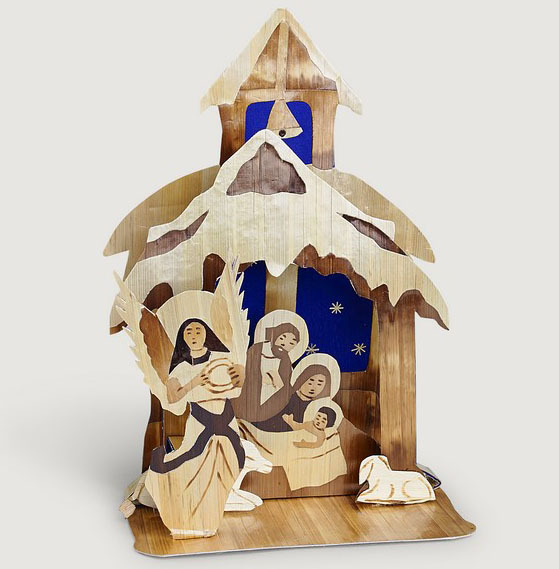 This nativity is made from wheat straw. Artisans cut and flatten wheat straw and scrape it with a knife to make it even. Artisans apply heat in varying degrees to bring about the range of tones from light tan to dark brown or black. Finally they cover the cardboard base with cloth to complete the item. Craftspeople use simple tools: a flat board, a pot of glue, a sharp blade and a pair of scissors. Small Advent Wreath Hand Cast Stone Made in U.S.A.
Tidings of Joy Nativity Hand Cast Stone Made in U.S.A.